Grips and why they matter. Grips and why they matter; well for a start they are often the most neglected part of any players equipment. You might notice during play they feel a little smooth or hard and you make a mental note to get them seen to but that’s soon forgotten as you play on, or I’ll wait till spring and get them done then, no point now, it won’t make any difference to me anyway, I’m not that good. The list can go on. They are however your only contact with the club, a firm comfortable hold on the club is essential to play your best golf. Do you put slicks on your car for winter ? Mentioning cars, car tyres have different compounds of rubber, a few minutes watching ‘Formula one ‘ will tell you this. The same applies to grips. Rubber in its natural form isn’t black it’s sort of creamy as you know, so additives are used to improve this and make it tackier and more resistant to wear. The principal additive is Carbon Black this obviously gives it the colour but it also add durability and tackiness, they use it in car tyres for the same reason, have you seen any red tyres on the road lately ? I thought not. Anyone who has the Golf Pride Multi Compound grips fitted will have noticed that the coloured section becomes harder than the rest, now you know why. 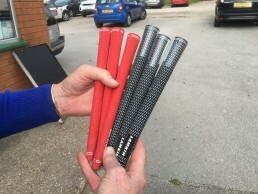 Some coloured grips are OK but they often have cord in them to add traction, as I said earlier there are different additives but I tend to favour the likes of Lamkin which have a proven reputation for wear and tackiness, essentially black with a paint in-fill. Next most important factor……….Size………yes folks it matters in grips too. Your hold on the club should be in the fingers and not too tight, important because tight grip pressure tends to lock the wrists, tense the forearms an shoot you shoulders into your ears, NOT GOOD!! Grip pressure should feel light and the key word is, ‘COMFORTABLE’, as the club is moved away from the ball grip pressure naturally increases until its maximum pressure at impact and then it releases. If you start your swing like this you will be a little freer and faster. The idea that thin grips make you hook and fat grips make you slice is not proven conclusively and is just a popular myth, to have an effect they would have to be like pencils or cricket bat handles. Just out of interest, why are grips tapered ?……………strips of leather were wrapped around tapered hickory sticks, no other reason. You can get, and some tour players use, grips that are practically parallel. Some are now going back to grips that have a ridge down the back of the grip to fit your fingers round. Arnold Palmer used to cut wire coat hangers into lengths and secure them down the back of his grips for this purpose. I used to set mine a quarter turn from centre so that when I closed my hand the face was locked square at address, you’d be surprised what custom fitters can do for players. The advice, clean your grips once a month with a nail brush and AJAX, rinse and dry. 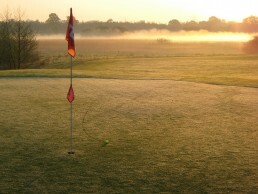 If you play more than once a week look to change them annually or at least the worn ones, wedges etc. On the crazy side most tour Pro’s change them every three months and one who does every three weeks. HAVE YOU BEEN CUSTOM FITTED ? A simple question to which a lot of people would answer yes to, especially those who have been to fitting days or discount stores or even on line sites etc. There are however some variables which should have been considered, see how many you were made aware of. 8 Clubhead face, MOI, centre of gravity design. 16 Grip material composition and design. 20 Club weight distribution/ balance point. These are the variables that should be considered and applied to the fitting process. I will outline the fitting sequence in my next post .